We were just talking about Steve and his sculptures a few days ago – and just this morning he sent in more photos of his latest creations. I’ll let him tell you about them down below the images. It’s been a few months since I posted…basically because I’ve been experimenting with different recipes and techniques, and every sculpt I make has been a different process. Hopefully the links above will show a few new pics. The fish and devil were basically traditional paper strips over balloon shapes, with your paperclay(plus some air-dry clay) added only on facial details. I no longer use the paperstrips for anything but the bottom of my bases. 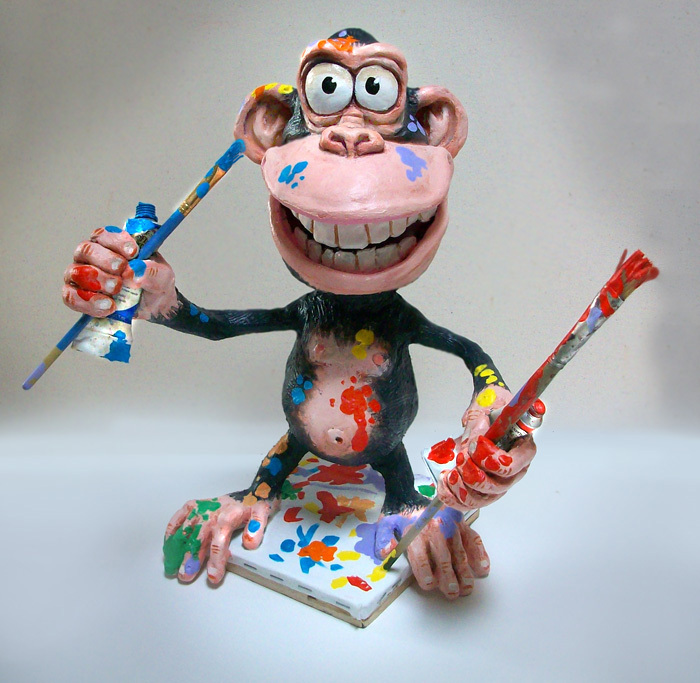 I made the monkey after looking at your rubber mold tutorial(was impressed with the detail you got on your ferret and walrus)….making the monkey face with clay and then casting paperclay plus Plaster of Paris added in a rubber mold taken from the clay sculpt. I also tried some harder plasters, such as Hydrostone, which made them considerably stronger and requiring less plaster. The molds are nice to make multiple copies, but even for single sculptures I will continue to model in clay and cast molds because I like the detail it offers, and for me modeling clay is so much easier. I keep the casting thin, then after it dries I smear a layer of your regular paperclay on the inside for added strength. 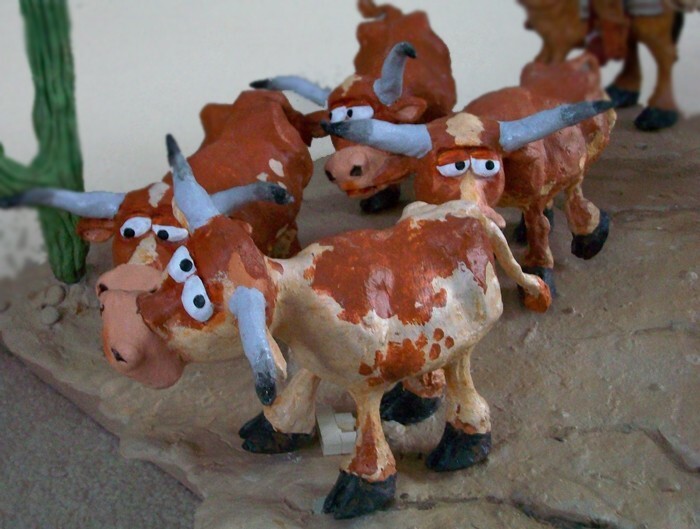 I only cast certain parts, not the whole thing….for example on the cattle drive piece I cast the cows heads and bodies separately, then connected legs and necks individually for posing and making each one an individual personality. 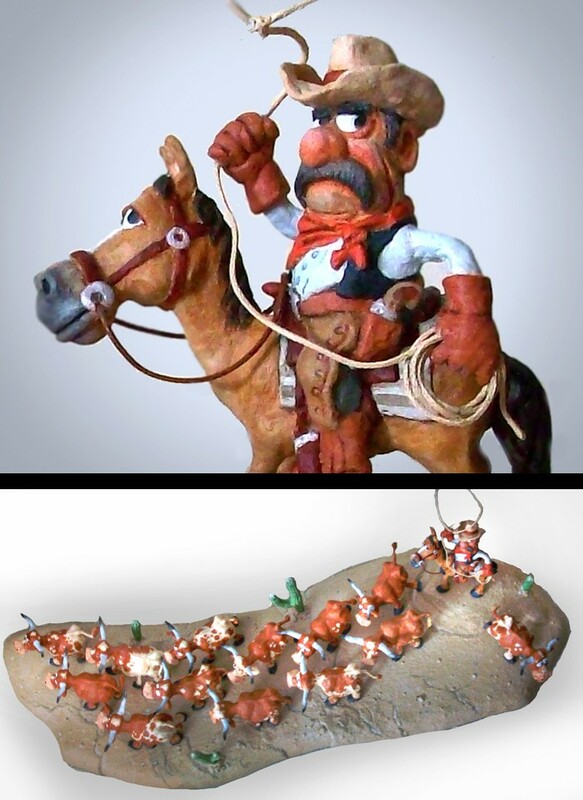 The cowboy was cast in three pieces…the cowboy’s head, cowboy body and horse body as one piece, and the horse’s head. Legs were added with paperclay over wire armatures. Besides wire I’m also using rigid foam a lot in my armatures. Jonni you mentioned somewhere you were experimenting with pottery clay that is not air-dry…I have doubts about how strong that will be. Maybe the glue will hold it together. My experience with non-airdry pottery clay is that it’s very fragile until fired in a kiln. With any clay added to paperclay you should be careful to allow it room to shrink as it dries(it would certainly crumble under just a wire armature, methinks). Other quick notes…I definitely recommend folks find an old blender at a thrift shop to shred the toilet paper in water, then squeeze the water out and use a hand mixer for the paperclay mixture. Makes it infinitely easier, faster, and non-lumpy. Also get a small heater fan to speed up drying(mine cost about 12 bucks at Target. Set at low heat and put in a small room or closet…not only dries stuff superfast but smells like baking bread. yum! Let me thank you again for this informative site…I have learned so much here. I’m also using your website creation tutorial to build a site to display my stuff (hopefully operational in a few days). Hope this wasn’t too rambling. Happy Mache-ing everyone! By the way, you can see more of Steve’s creations, including his cartoons, here. And read his other comments here, here and here. Nice blog, it was like a visit to a gallery. Been having a good look at Steve’s sculptures, fantastic! What sort of size are they? Seems everyone is switching to paper mache clay, it must be good stuff. 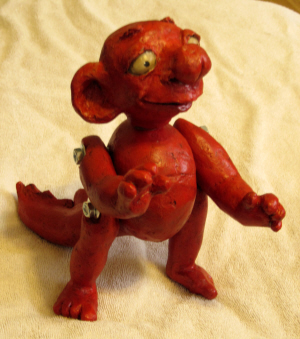 I think it may have worked well when I made my little red dragon. Be sure to take a look at his current work on his new blog, too. You’ll like the Jester. I didn’t think that paper mache could be used for stop action video, but now I think I’ve changed my mind. If he was wearing trousers and a long-sleeved shirt, and if some simple joints were added for elbows and knees, I think you do some fun things with it. If anyone tries it, please let us know. Heh! I kind of like his industrial-style joints. Maybe you could sort of antique them like you did the rest of him? He’s adorable! Anthrop-dino baby-thing! Love the synergy of all the talent and experimentation! 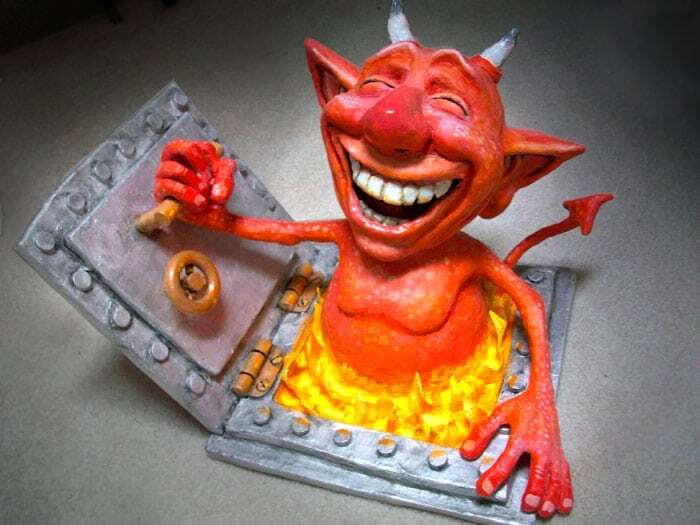 Steve, the funny concepts behind your sculptures gives them such life. After looking at your cartoons, I wouldn’t expect any less. Going 3-D is so perfect for your style! I think we definitely need some step-by-step tutorials from you, too. Jonni, what are you making with all these experiments? I wanna see! Steve’s cartoons look almost more 3D than his sculptures – what talent that guy has. Whew! Ah! I wondered how your chickens were getting along! Are they pet-like, or yard-ornament-like, or something in between, now? 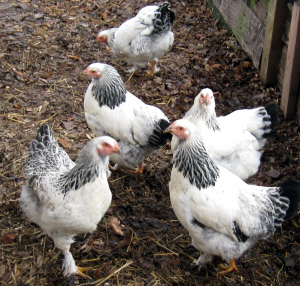 Do you expect them to start laying soon? (I know just about nothing about chickens.) 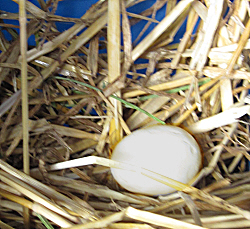 That’s pretty interesting about modeling nesting with just an egg. Did you take any pictures of your manikin in his developmental stages? I’m curious about the failed joints. Baby rhino! Perfect. You manage to get both cute and realistic into the same creation so well, that’s a good match for your style! Can’t wait to see her. The group you’re doing the fundraiser for looks very worthwhile. I hope you raise a ton of money for them. Cartoon characters … I’ve come up with the brilliant idea of doing a little video story for my grand-niece; telling the story while drawing the illustrations. Sort of cheap-o animation. By necessity, the drawings will have to be simple, cartoony, so I can do them fast enough to keep up with the story. Simple isn’t really my style! It WILL be a challenge! Ooh – are you going to use Camtasia or other screen capture program for the animation? I love your idea. Will you share it with us when it’s done? Oo! That’s what I was looking for! Too expensive, though. Looking for free alternatives now … Fun! You can download the Camtasia program and use it for free for 30 days. If you don’t think you’ll be going into the animation business, that seems like the best route. OK – sorry I brought up the goose thing – I really like geese. My mac isn’t up to Camtasia, unfortunately (needs the intel chip), but I’m messing around with a freebie and a trial version of a low-cost screen recorder. Neither is at all perfect, but might work for this little project. just amazing. Love them… ALL. Make us a couple of youtube tuts too!!! These are FABULOUS! The facial expressions are priceless. The monkey is my favorite. And yes Jonni, these photos are very inspiring! I mixed it a loooong time, to make sure all the little particles were coated with the glue and joint compound. The result is not quite as strong as the original PM clay recipe, although it still takes considerable effort to break it after it dries – and it’s very hard, although it’s easier to sand than the original. I dried mine in the oven at 200F to make sure it was dry all the way through. I’ll play with it some more and let you know what happens. If anyone else wants to experiment, too, let me know and I’ll give you the exact recipe I used. According to the article maybe adding a little cornstarch would help add strength to your clay. I don’t do the entire piece with the self-dry clay additive…I make the rough form with your original recipe, and once dry go over that with the self-dry clay/mache mixture to do details…that way the strength of the Jonni clay reinforces the self-dry clay mixture. The idea is to work in layers as opposed to a complete sculpture in one sitting. 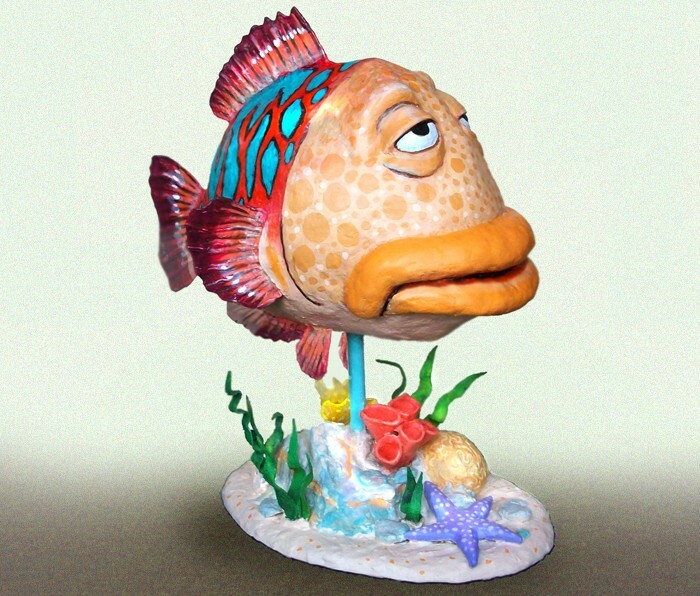 There is a company called Aves that makes something called Clay Shay…a clay and paper mache combo. Just add water, feels like clay, and sets in a couple of hours. Gets hard as a rock too, but unfortunately is too brittle when used for detail or thinner applications. If you intend to make thicker designs I would recommend trying it. Sometimes I mix it half and half with Jonni’s recipe. Thanks folks for the kind comments. I’m too shy to do a youtube tute tho!